Time for our first budget update of 2018! I debated whether I should keep sharing our real personal finance numbers with the world or not. I started being transparent with our income and expenses in the fall of 2013 when we decided to buckle down and tackle six figures of student loan debt. The accountability has been huge! Knowing that I’ll have to share everything with you keeps me in line more than you know! In the middle of 2016 we finished paying off $144,000 of debt, but I have kept sharing these updates for several reasons. I don’t think money should be taboo (more on that here). Income is just money. It doesn’t define you. It says nothing about whether you’re a good person or not. It has no bearing on whether you are happy or not. It’s just money. There’s no shame in making more or less of it. How many real budgets have you seen besides your own? Probably not that many. How do we expect people, our kids especially, to learn how to manage money if they don’t see how someone does it? Many of you were never explicitly taught how to budget or manage money (I know because you’ve told me!). It’s so much easier to do when you’ve seen it done. We’re open to showing you the ups and downs, not just the things we do right. I want to encourage you! Budgeting doesn’t have to be a bad word. You can reduce your expenses and stick to your plan. I hope that being transparent and vulnerable will help encourage you and show you that bugeting isn’t as hard as you might think..
Plus, sharing our budget really does keep us on track and motivated. Even though we’ve paid off debt, we’re not done with our financial goals. It’s not a free-for-all now that we’ve paid all of our (non-mortgage) debt. To add something new this year, I will be sharing a budget update video where I’ll walk you through our budget. I’ll share my screen with you so you can see exactly how our budget looks and how we manage it. I’ll not only show you what happened in January, but I’ll show you what February’s budget looks like now before any mid-month changes (which always happen– a flexible budget is a good thing!). Okay, onto the numbers from January 2018! Our total income for January was $10,765. Since we live on last month’s income, this is money that we’re waiting to spend in February. Attorney Income (Day Job)– $6,250 Mr. SixFiguresUnder has been working full-time as an attorney for the state of California since the fall of 2015. His actual take-home pay was $4,950 but I add back in the cost of the benefits (insurance, dental, vision, parking, union dues and retirement) that are automatically taken out of his check so that you can see what happens to the money that never makes it home. Attorney Income (Private Practice)– $1,645 On top of working full-time, my husband has a part-time private law practice on the side. He started it to help speed up our debt payoff and because he had clients from his days at a small firm that didn’t want to let him go. This income fluctuates greatly from month to month. My Income (Blog)– $2,870 The income that I report is the income that I received this month minus all of my blogging expenses. Of this, I’m setting aside 25% for taxes ($718) and distributing $2,152 to the family checking account as my paycheck. Last year I set aside 30% of my blog earnings and it more than covered our tax liability for both of our businesses. If you’re a blogger (even if you’re just getting started), check out my Blog Finance Spreadsheets. They really make keeping track of my blog income and expenses really easy (and, I daresay, fun!). I also share all of the details pf my blog income with my Behind-the-Scenes Blogging email list. Escrow Overage Refund– $1,706 I’m not including this in our income total, as it’s more of a windfall (and it’s money we’ve already tithed on). When we bought our house a year ago, we paid a lot of the escrowed costs for several months in advance to create a buffer for the timing of different bills. I guess after a year of payments they look at what’s in the account and what bills are on the horizon and see if there is an overage of defecit. We were not expecting this at all! You’ll have to wait until next month to see what we’re going to do with it. Any guesses? Each month we budget down to zero using last month’s income. When we started doing this, it literally changed our lives! For more about how living on last month’s income works and how you can get started, check out my free Guide to Getting a Month Ahead Financially. Our spending in January came from the income we earned in December Here’s how we spent money in January. Tithing– $1,058— We happily pay a 10% tithe on our total income from the previous month (December). You can read more about why we paid tithing, even when we were in debt. Other Giving– $88– Other giving this month. Mortgage/Rent– $2,500 Our actual mortgage is just under $2,500, but I like paying a little over to make a nice even number. Curious about our mortgage? You can read more about why we got a conventional mortgage instead of FHA or USDA and then why we didn’t wait for a 20% down payment. Electricity– $278 Our electric bill was nearly the same as last month. Keep in mind this is for two households, as our renters are on the same meter. If you’re in California, Toronto or Texas, you should definitely check out the OhmConnect program which lets you earn extra money for saving power. My kids think it’s super fun to save power now. Water– $45 Our water bill comes every other month, so I just set aside approximately half of what I expect the bill to be (or what it is). Trash– $32 Our bill for trash service comes every other month, so I set aside half of the bill each month. We’re currently paying for curbside pickup, but that’s not the only way to do it. If you’re trying to cut every expense to its bare minimum, here are some ideas to save on trash service. Internet– $50 After talking to our tax guy, we figured out how to split this expense between what our family uses, what our renters use and what each of our businesses use. Technically only 20% goes toward family usage, but I’m still going to record the whole number here rather than explain why our family only pays $10/month for internet. Home Phone- $4 Since my husband works at home a day or two each week, we decided to get a home phone for him to use. It’s Ooma, which is internet-based, not a traditional land line. The monthly service is minimal and the set-up (hardware, etc) was under $100 (that link will get you a $20 Amazon gift card on top of it!). Republic Wireless Cell Phones– $13 We’ve been using Republic Wireless as our cell phone carrier for over three years now. This covers the cost of service for my phone, including all taxes and fees (we’re on the Republic Refund plan). My husband also has a Republic phone which he uses for his private practice, but that’s a business expense, not a family budget expense. If your cell phone bill is killing you, I definitely recommend that you check them out! Health Insurance– $408 We have insurance through my husband’s employer. This is the portion of the insurance premium that his employer does not cover. It includes health, dental and vision insurance premiums and comes straight out of his paycheck. Car Insurance– $140 Our auto insurance at USAA is fabulous! In addition to the wonderful coverage, they also give us dividends at the end of the year, which is always a nice treat. We’re able to get insurance with USAA because my father-in-law was in the service years ago. If you, your parent, or your spouse were in the military, you’re probably eligible for USAA too! Gas– $370 Our cars ate more than we did in January! Last time I filled up (at the cheapest station around) it was $2.97/gallon. Parking– $155 Working downtown means paying for parking. It comes straight out of my husband’s paycheck, which means it is paid for with pre-tax dollars, a small consolation. Clothing– $7 I bought several pairs of kids shoes at the thrift store that will fit my kids now or in the near future. Household– $145 In addition to our normal toiletries and household things, I got some things for our 72-hour emergency kits. I’ll be doing a post and video on 72-hour kits soon! Fun– $5 This was money for a toll bridge from back in December that we paid after the fact because we didn’t have cash at the time. The bridge itself (and the fee that FasTrak tried to charge us wasn’t “fun,” but the reason we were in the Bay area was fun, so that’s why it’s in this category! Animals– $36 We bought three 40lb bags of chicken feed. Tax Prep– $90 Our tax advice and preparation plan allows the cost to be spread over the year. Supplemental Property Tax– $158 The property tax that is included with our mortgage doesn’t include the increase in taxes that comes from the reassessment at the sale of a property. California property tax law is a peculiar thing and we don’t need to cover all the details, but in short, when a property changes hands, the property tax bill generally goes up. This wasn’t a fun notice to find in the mail. If we set aside $158 each month, we’ll have the money when the bill comes again. Now that we’re done funneling every extra cent toward debt, we are using sinking funds in our budgeting. This is money that we set aside each month into certain categories where it builds up until we need it. The amount in bold is the amount that was added to the fund. Any spending from the fund is noted in the comments. Home Projects– $1,058 We budgeted $1,500 for home projects this month, but we didn’t get around to doing the projects we had planned, so I’m turning this into a sinking fund. We did buy a chainsaw though which used $441 of that money. We’ll just leave the remaining money there for when we get to the projects in February (hopefully). Dental– $30 This is always the first sinking fund we cut when things are tight because dental expenses come up so infrequently, but we actually funded it this month! Medical– $65 We had put $100 into our medical sinking fund this month, but used $35 to buy glassesfor our oldest daughter. The current total in our medical fund is $240. Car Repair– $0 We had to get a new water pump for the van, which took what little we had in our auto repair fund plus an additional $400. We had budgeted $150 at the beginning of the month, but had to do some rearranging to get money from other categories to cover this expense. Car Registration & Smog– $40 We will have registration due for the van next month. The current category total is $104. Christmas– $100 Getting started for next year! Life Insurance– $70 If we put aside $70 each month, we will have our premiums set aside when they’re due. Gifts– $14 I put $40 here, then spent $38 on birthday gifts for a family party we went to, leaving just $2. I also returned a gift purchased last month which put $12 back into this fund. Retirement– $631 With my husband’s state job, this amount comes directly out of his paycheck and into his state retirement fund. College Savings– $100 We contribute $25 per month per child to 529 accounts (for the older four). It’s not much, but it’s a start. More on our decision to start saving for college in this post. Our goal for 2018 is to reach $25,000 in our emergency fund. In January we didn’t contribute anything to the emergency fund because we want to focus on maxing out my IRA first. We’re planning to put in the full $5,500 between now and April 15th (for the 2017 tax year). We also want to save an additional $5,500 for my 2018 contribution. Because my husband has a pension plan working for the state, contributions to his IRA don’t have the same tax benefits as contributing to mine, so we’re just working on mine right now. In January we contributed $1,607 bringing the total to $2,507. 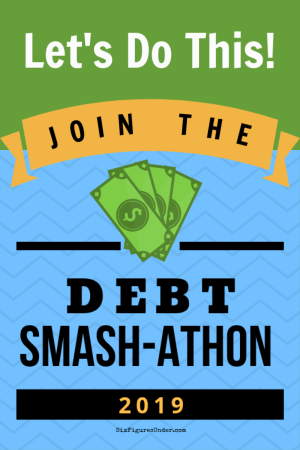 I’d love to hear about how your budget and/or debt repayment went in January! How is your progress on your financial goals for 2018? If you have any questions about how we budget, I’m happy to answer them in the comments or in a future post. What an awesome start to the new year, Stephanie! Best of luck on your savings goals. With your track record, I have no doubt you’ll hit them both. (1) Our January budget and debt repayment were great! We paid off $8,000 last month. We’re “six figures under,” too, but quite a bit more than you were when you started ($670,000). (2) We’re ahead on our financial goal for this year so far. Our goal is to pay off about $70,000 this year, so about $6,000/month. I’m hoping we can keep up the pace we set in January. Prayers up and fingers crossed for us please! Wow! That’s a great start to the year! Wishing you the best! We had a fun month in January, but since it was summer break and we had visitors from overseas, we did spend a bit more than usual on fun stuff. We also had back to school expenses, and we booked a holiday for March. But, we’re still doing okay with savings. We also rejigged a few bills to save some more. The power company told us their fees and tariffs were going up. We used a comparison website to find a better offer. I’m not sure I agree with their assessment but the new power company is estimated to save us about $400/year. My car insurance is due next month, so I did a price comparison and saved $150 there too. (I have an older car, my total premium is less than $200 for the year.) I figure saving an extra $550 for about half an hour’s work is time well spent! This month we’re hoping to buy our kitchen cabinets. The plan is to have as much of the kitchen done while we’re away, to avoid the mess. I am not looking forward to the dent in our savings! But I am looking forward to a wonderful new kitchen. Wat to save with the price comparisons! Definitely worth the hourly wage! That’s crazy (crazy cool, that is) that you have options for power companies! We have exactly one option (unless you go without power, of course)! A kitchen remodel sounds exciting!! I love your budget updates. I don’t know why more people don’t talk about their finances – unless you’re bragging about them, I think it’s a good way to learn from each other. We did okay in January. We had to do a radon test on our home which slightly lowered what I hoped to put toward debt, but pretty soon I hope to be under $50K in student loans. We are also hoping to pay off our car soon and then it will be just student loans :). You guys are making great progress!! I am extremely transparent financially. I wasn’t raised that way but I just find that money isn’t that big of a deal. I love that you make these posts. I have had the sinking funds for years but didn’t have a name for them. We are trying to put money away for retirement. I get excited for each paycheck! I am glad that you show me that others feel excited to pay off debt and save also. Thank you! I think that’s great that you’re transparent with your finances Marty! Good luck with the retirement savings! Please keep sharing real numbers. We look forward to this post every month. It was so interesting watching you tackle your debt. Now that you have a mortgage and a higher income, we worry that you will end up in the “two income trap”. From our perspective, your mortgage is frighteningly high. Regardless of politics, we read Elizabeth Warren’s book _Two Income Trap_ years ago and found it to be very informative. Thanks for your comment and your honesty, Amy. I’ll have to add that book to my reading list. Our mortgage is high for pretty much anywhere else in the country, but it’s pretty normal for California. We got a great deal on our house. It has gone up in value quite a bit and while that doesn’t change the monthly cost, we feel good about the investment. We plan on paying it down faster to save loads on interest (I’ll be sharing more on those plans soon). As far as requiring a second income, since my work is very part time and completely from home and something I enjoy (it’s my creative outlet), we feel very blessed. I love these posts as well. She is no where near the two income trap so I have to disagree. She lives in the state of California & property there is just expensive so her mortgage is actually very reasonable. I think this family does an awesome job & I love the transparency. It encourages me & im a senior citizen with grown children. It encourages me to help advise my grown children with their children. I usually never post my opinions on things like this but I did take offense to the previous negative post. You know that old saying if you don’t have something nice to say don’t say anything. This family is doing amazing while raising a large family showing yes it can be done. Keep up the great work. I don’t think it was a negative comment. If Mr Six Figures was only working his day job, their mortgage would take up half of his actual take home pay. Rent/mortgage should be no more than 1/3rd of your income. Theirs is a very normal household where it is necessary to work more than one job to make ends meet. I am sure they are well aware of that! There is nothing wrong with their situation; it is what it is. Thanks for the kind words CC. I’m glad the post was encouraging to you! I am also happy that you have chosen to continue sharing your budget brakdown with your real numbers! It has been an amazing motivator for our family. You may have mentioned this before in a previous post – but where/how do you classify your income from the rental? My assumption would be that it goes into the mortgage? I’m curious to see what you use your escrow refund for…maybe some larger animals?! I’m always impressed with your grocery budget and “fun” budget! Do you guys go on dates?? If so, where do you put that in your budget? Basically all of our dates are cheap or free these days (just blogged about it) but some day when we’re not in $500k of debt I’d like to go on a not-totally-frugal date haha. Good question! We don’t go on tons of out-of-the-house dates. I’m kind of weird about leaving the kids with babysitters (besides grandma every once in a while). As soon as our oldest (almost ten) is old enough to babysit, we will go out on dates more (I think). Until then, we have dates at home mostly, which we are actually fine with (and not just because we’re frugal)! We party after we put the kids to bed. 🙂 The other night we did karaoke at home (through YouTube) and it was a blast!! We like reading together, playing games, cooking, having friends over, working on projects, eating treats, working out, and just talking. When we do go out with just the two of us, we take the kids to Grandma’s or she comes over here (that was one thing that was easier when we lived in their basement, though it was in the boonies, so there’s that!). This is absolutely fascinating to me. I don’t think I have ever seen a budget post that is this straight-forward and specific. I love seeing how your budget compares with my own and think it is great that you are definitely inspiring others to budget as well. Thanks so much for sharing your post with us at Merry Monday this week! I look forward to reading more of your writing!